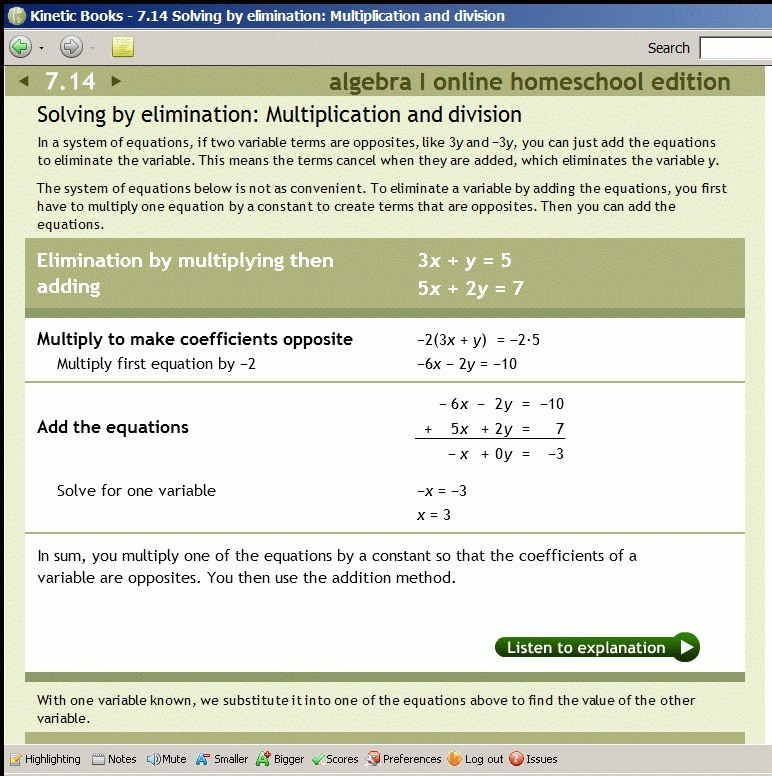 Kinetic Books Algebra 1 is a digital textbook for algebra 1. 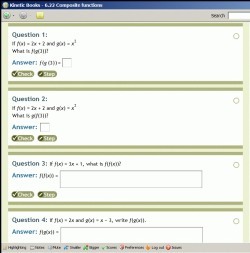 This means it is a computerized and interactive curriculum. This is a complete stand-alone algebra 1 curriculum, containing the actual instruction, exercises, homework problems, quizzes, and tests. These 13 chapters are divided into 136 lessons. Each of the 136 lessons in turn is divided into several small sections or pages that the student studies using the software. 13.20 End of Unit Problems. This means that the program goes through algebra concepts and topics in small increments or steps (each small section is one such step). You could say the concepts are "scaffolded" well. The product also has "Listen to Explanation" buttons. 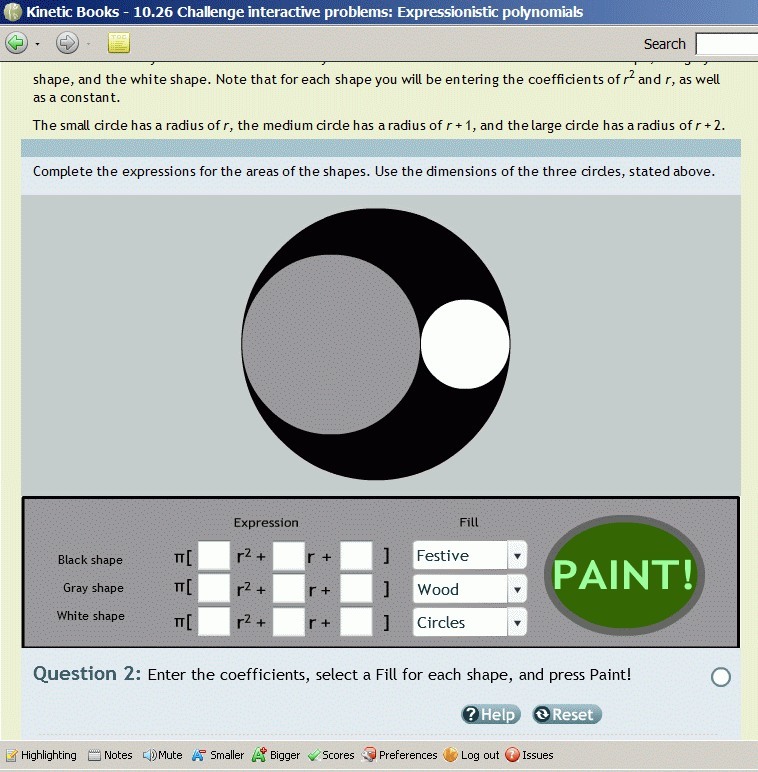 If you click one, you will hear and see the text for step-by-step explanations of the example problems. And, you also get access to videos – one per lesson – that show how to solve some of the problems in the digital text. Each lesson (or unit) contains "Kinetic Homework". This simply means a small number of problems (4-10) that are checked by the computer. Each lesson (or unit) also contains "End of Unit Problems". 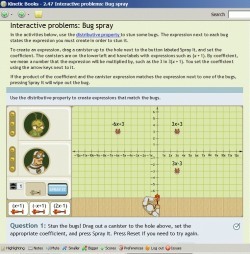 This is a long list of problems that are not interactive; in other words, they are just like any problems in a regular textbook. These problems include some challenging ones as well. Typically, the instructor would assign some of the End of Unit Problems for the student to do. The program provides answers to these, but not full solutions. The product comes with a 752-page PDF textbook. This textbook contains the same text and all the problems as the online version of the product but lacks the interactivity. It is essentially screenshots from the digital curriculum. 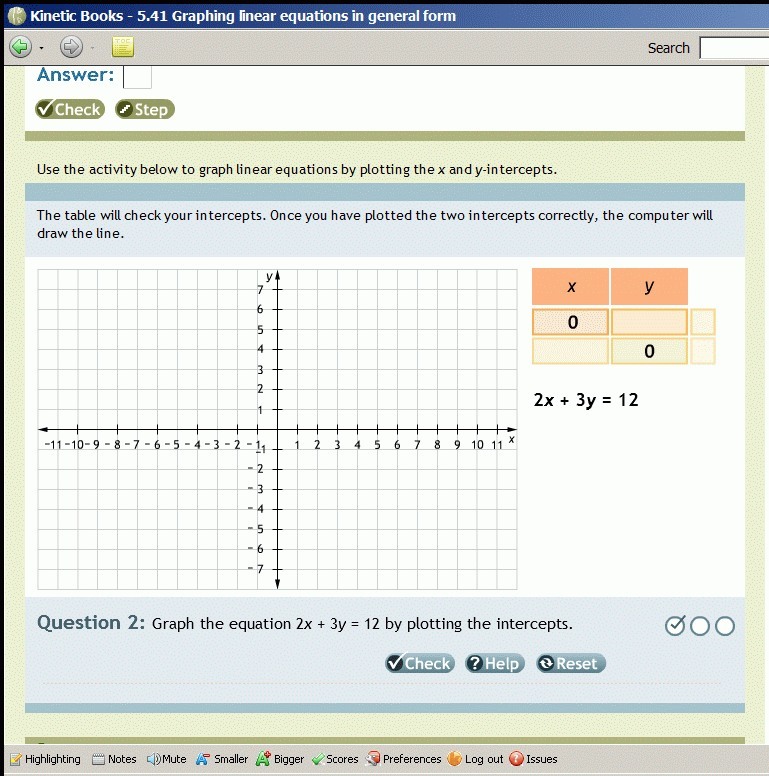 As you do problems in sections and in Kinetic homework, the computer will keep track of your score for each lesson in each chapter. However, it doesn't restrict you to any particular lesson. You can always access any lesson any time. Also, I didn't notice it keeping track of where I was at in the program. So while it keeps the scores for the problems, you need to remember where you left off, in order to continue at the right place (just like when using a normal book). 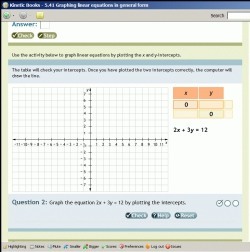 You can also get a good feel for the typical coursework by checking the samples provided on their site: Graphing a Linear Equation Quickly and Solving the equation by isolating the variable. So, it is basically text on computer screen. But you can listen to an explanation which will go through the example step-by-step. If you already know the concept, you can skip all that and just do the exercises on that page. The book has over 3,000 problems where the textbook checks your work and offers step-by-step help if needed. Some lessons with application problems have what are called "paper & pencil quickcheck" problems. There are no solutions to these; the student is supposed to be able to solve them by studying the example and its solution. 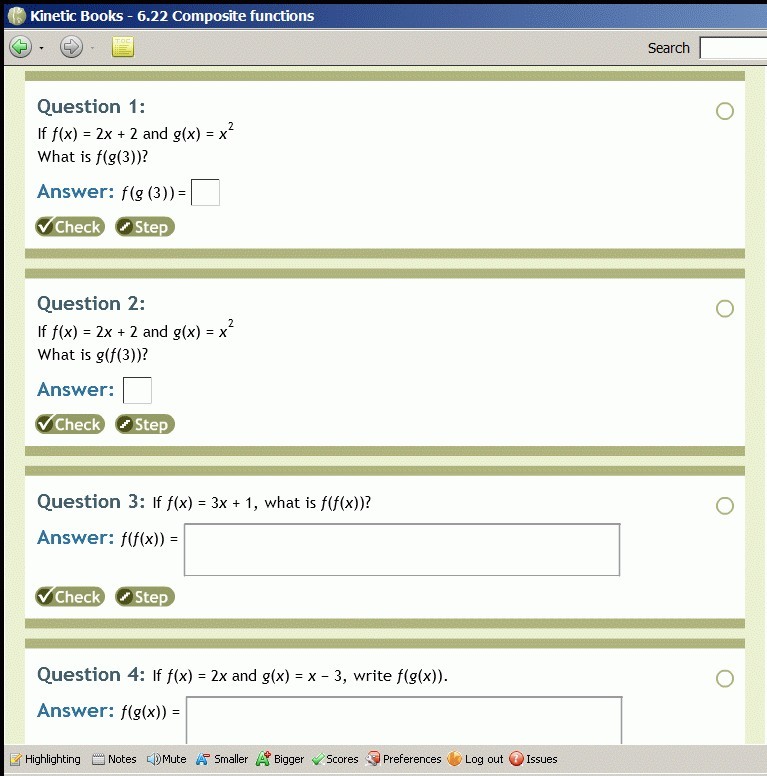 The digital book also includes a fair amount of real-world applications of algebra in every chapter. Some examples include mean arterial pressure, profits in a business, time, speed & distance, equations involving money & motion, ciphers, frequency & wavelength, pilot accident rate, irrigation system, etc. Some of these are provided as "challenge applications". 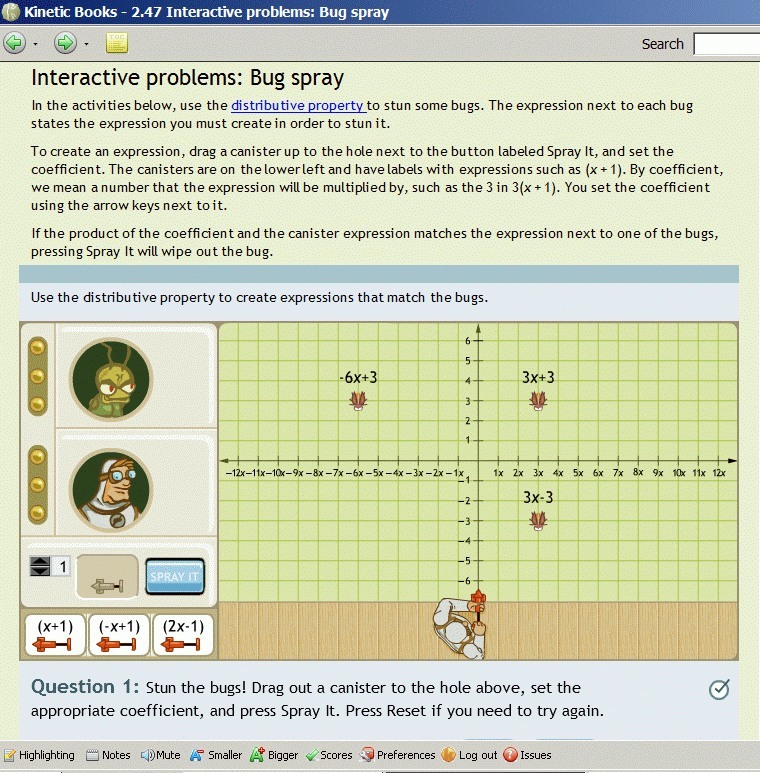 I think this can be an excellent choice for algebra 1 curriculum for any student who likes computer-assisted teaching, interactively checked exercises & quizzes, and some games and fun activities in between. The product is very well done in all those respects. Folks, millions of dollars have been spent building the various Kinetic Books products, so no wonder it is well done, and has all this variety! The program is designed to be quite self-teaching, and will probably require very little parent involvement in the main lessons. However, I'm not saying that the parent can totally stay away from the learning process; that will depend on the student. 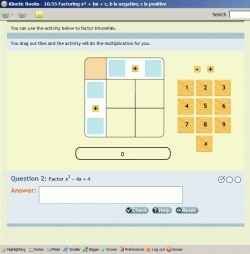 For example, the product includes some challenging problems where parent involvement may very well be needed. If you want to find lacks or shortcomings, one is that the end-of-unit problems and the paper-and-pencil quickchecks don't have full solutions, just answers. There has been some demand for these, so maybe the company will eventually add them. Secondly, there are about 20 contributors and they include people writing text, creating art, programming software and testing. Since this is done by a team and not by a single author, the text reads very "sterile" (as do most all schoolbooks, in fact). It's not really a lack, it's just how schoolbooks usually are. I have read some algebra books by single authors where you can feel an "author's touch" which makes the text more lively. I also feel that such books can perhaps present a more connected picture of mathematics. 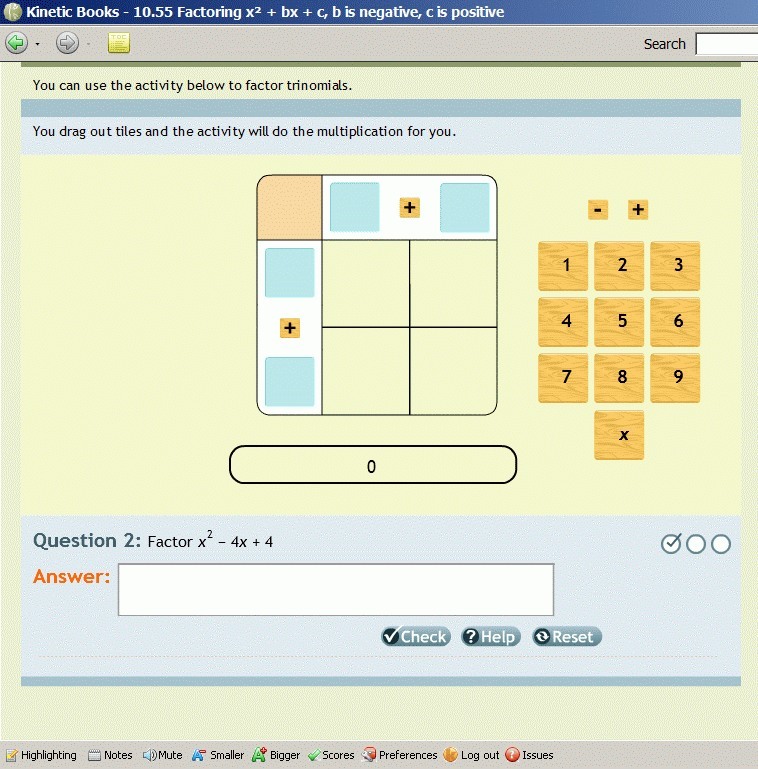 So, some will probably prefer a textbook, but my guess is that many students will prefer the instant feedback, computer-checked exercises, and the fun games & activities found in Kinetic Books Algebra 1 over a traditional textbook. Check out the sample lessons on their website to see if you or your student(s) would like the product. 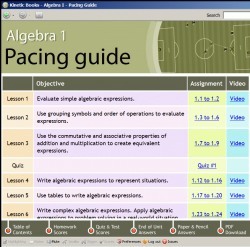 Note that Kinetic Books Algbera 1 does not come with a physical textbook. You might want to invest a few dollars in a used algebra textbook so you can have the information handy after completing algebra 1. 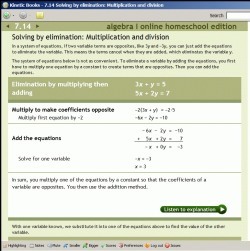 Pricing for homeschool: Algebra 1 – $79.95; Algebra II – $79.95; Geometry – $47.45; Pre-Algebra – $79.95. This gives you one-year access to the program.